Newcomb College was founded in 1886 by Josephine Louise Newcomb, and an art curriculum was part of the course work from the start. Art classes were held which taught that there was beauty in practical and simple things. The college hired people like Ellsworth Woodward from the Rhode Island School of Design, one of the leading design institutions of the time. To Woodward, he saw the art department as a vehicle through which to train a new generation of young women artists. 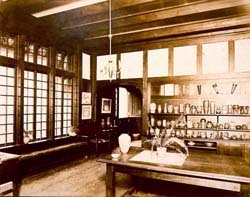 Soon after Woodward's arrival, the college also hired Mary Sheerer to teach pottery making and decoration. She was already a recognized authority on pottery and ceramics and a graduate of the Cincinnati Art Academy, and with her on the faculty a spotlight began to fall on the college and its students. Newcomb Pottery was established in 1894, and just after the turn of the century Woodward persuaded the college to fund a separate pottery building and sales floor. Newcomb Pottery was heavily influenced and inspired by the English Arts & Crafts movement, precursor to the American Arts & Crafts period. Nevertheless, it exhibited a unique originality in its distinct southern motifs. Newcomb Pottery was one of the finest American examples of hand crafted art pottery, and it was praised by art critics and loved by consumers. 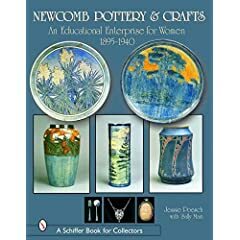 Newcomb had the unusual segmentation of having all male potters and all female designers, and in a strange way unleashed superlative creativity by both sexes. The designs reflected their heritage in the old south, with floral decorations distinct to the region and made from the high quality local clay. Many graduates went on to work at the pottery, and a very familial environment was always present. Newcomb adhered to high standards of quality, and profitability was never a central focus of the firm as was true at many other contemporary art potteries at the turn of the century. Every piece of Newcomb pottery was hand crafted and custom, and no two pieces are alike. The pottery won recognition internationally as well, winning 8 medals at international expositions, and it was exhibited around the world. 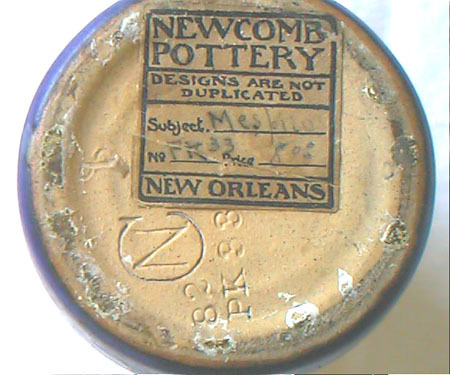 The pottery was sold in shops and consignment stores across the country and were advertised in the school magazine, the Newcomb Arcade. The pottery works were in production until the advent of World War II, a span of almost 50 years, and over 60,000 unique works were produced. The earliest marks were simply the name of the college, used from the founding until approximately 1900. A mark of an N inside a C was used from the middle of 1897 until the early 1940s when production ceased. Newcomb is best known for their unique shades of blue and green ceramic although other colors were produced as well. Earlier work tended to be done in earth tones of green and yellow, while the early 1900s saw more use of a transparent matte glaze over blue and green base colors, with pinks appearing in the early to mid 1920s of the Art Deco period and a cobalt blue color first appearing in the 1930s. Of the many female designers who worked at Newcomb, Sadie Irvine was the best known and was working at the pottery for most of its years of existence. She enrolled at Newcomb College in 1902 and graduated in 1906, and she was the cornerstone of the design team from 1908 until 1929. 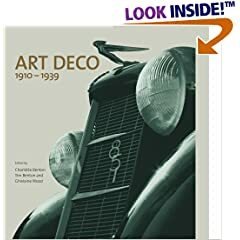 After that, she stayed at the college and taught pottery design, drawing, watercolor, and embroidery until her retirement in 1952. Buy finer ceramics on the Collectics Fine Antiques and Pottery pages, or search the entire site for great antiques, collectibles, and crafts for every collector! 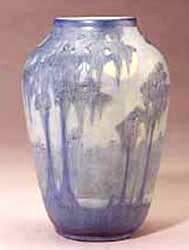 Sell or consign period Newcomb, Rookwood, Weller, Grueby, and other finer art pottery at Collectics. Read about our top performing national consignment program for estate and personal collections.